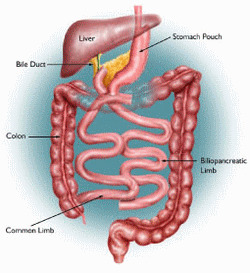 The Duodenal Switch (DS), also known as Bilio-Pancreatic Diversion with Duodenal Switch (BPD/DS) is a combination type of weight loss surgery, resulting in both restriction of food and malabsorption of calories. However, in addition to having the size of your stomach reduced, duodenal switch surgery also involves extensively re-routing the small intestine so you absorb less than all of the food you eat...especially the fat. The malabsorption caused by the duodenal switch is much greater than that caused with the gastric bypass because the amount of small intestine that's bypassed is greater. Basically, you won't be able to eat as much, and you won't absorb all the calories and fat you do eat after BPD/DS. The percentage of weight loss is greater (usually about 70% of excess weight) than with other weight loss surgeries because this procedure causes the highest rates of malabsorption. While it may sound great to avoid absorbing all the food you eat, as a dietitian, the notion freaks me out a little! That's because if you don't absorb all of your food, you don't absorb a lot of important nutrients either. Since you're not able to digest all of the fat you eat, you also won't be able to digest the fat-soluble vitamins: Vitamins A, D, E, and K. That means you'll need supplements. You'll also need extra calcium, iron, Vitamin B-12 and folic acid. Because of this malabsorption it's essential that you monitor your vitamin levels and take your prescribed vitamins for the rest of your life. Of course, it's best to get all your vitamins through food, but you're no longer going to have that option! If you're not a good pill taker, or seem to "never remember" to take your vitamins, you'll need to vastly improve those habits...otherwise this surgery isn't right for you. Research shows that 25% of patients who don't closely follow diet and vitamin supplement instructions develop problems that require treatment. Before you have duodenal switch surgery, make sure you're clear on how often you'll follow up with your doctor to have your vitamin levels checked (ideally every 6-9 months). While it might sound wonderful not to absorb all the fat you eat, you should know that malabsorbed fat results in smelly and loose bowel movements, even diarrhea. But why would you have surgery and keep eating lots of fatty, greasy, foods anyway?! A lifelong lowfat diet, small portions and regular supplementation is in order after BPD/DS surgery. Want to be as informed as possible about this surgery? Read more clinical data on the duodenal switch.